While no managed environmental water was delivered to Barmah Forest in 2014–15, natural flooding built on the five-year legacy of environmental watering within the forest. The Living Murray program is one of Australia's most significant long-term river restoration programs. It aims to achieve a healthy working River Murray system for all Australians by delivering environmental water to over 37,000 hectares of forests, wetlands and lakes along the River. Four sites in Victoria have been identified as 'icon sites' for restoration. These sites include Hattah Lakes, Lindsay-Wallpolla Islands (including Mulcra Island), Gunbower Forest and Barmah Forest. Environmental water has been released into Barmah Forest every year since 2009 with excellent results. These results include wide-scale bird breeding, recovery of native fish in and around the Forest, and in particular, an improvement in the health of river red gums and growth of Moira grass – a severely threatened native plant. Two natural floods occurred in July 2014, followed by brief periods of overbank flows in August and November 2014 and January 2015, so there was no need to release environmental water into the Forest. About 25 per cent of the floodplain was inundated in the July and August events, benefiting wetland plants, frogs, fish and turtles, while the November rain created flow variability that caused golden perch to spawn. If natural flooding didn't occur, we planned to use environmental water and other river management options to support breeding. Keith Ward, Living Murray Project Manager (Barmah) with the Goulburn-Broken Catchment Management Authority, said in 2014–15, waterbirds were attracted to the Forest wetlands. Unfortunately many abandoned their nests – a natural response to changing seasonal conditions. "Approximately 500 Australian white ibis initiated nesting at one wetland in Barmah Forest (which is a lot less than the thousands we usually see with managed environmental watering). Unfortunately nesting was prematurely abandoned just as egg-laying had commenced in the earliest nests," he said. "We knew that ibis had also abandoned their nests a week earlier on the north side of the river, where water levels had been retained at a significant level. The weather pattern then became quite dry. We are now investigating to pinpoint exactly what triggered the birds leaving the wetlands, so that we can try to extend nesting in future." 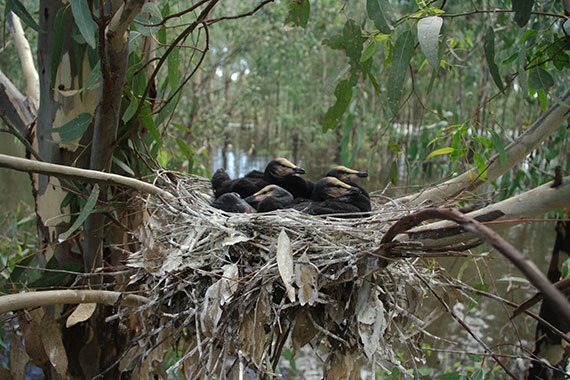 Keith said waterbird nesting numbers in Barmah Forest fluctuate in line with the frequency and continuity of flooding during the spring-summer nesting season. Throughout the year, the nationally endangered Australasian bittern was also frequently heard and occasionally sighted within the Forest wetlands, including one photographed by a time-scheduled camera on site.